Lincoln Quilt Bedding by VHC Brands | P.C. 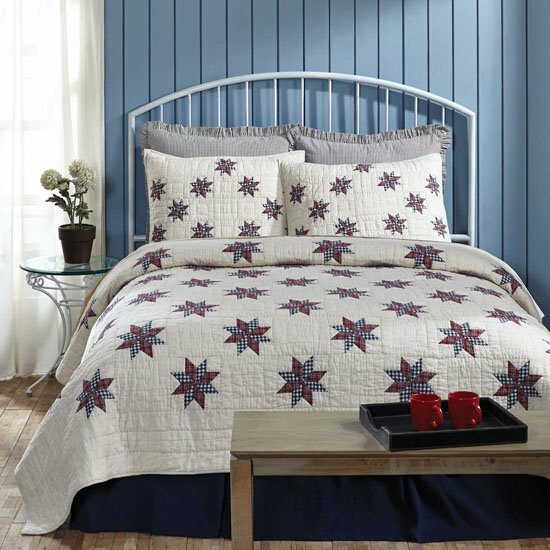 Fallon Co.
A classic American design in classic American colors, the Lincoln design proudly displays 8-point patchwork stars of denim blue, ruby red, and tan-based plaids in a star chain pattern. All cotton and hand-quilted, the Lincoln exudes timeless Americana culture. Lincoln pieces offered are quilts, bed skirts, standard shams, king shams and Euro shams. Quilt and shams are machine stitched and hand-quilted in echo and stitch in the ditch patterns. Quilt reverses to a classic denim blue ticking stripe which is also used for the Euro shams. 100% cotton. Imported. Machine wash in cold water on gentle cycle.